A call to phase out Southern California’s biggest natural-gas storage site in 10 years, and bring in efficiency, solar PV, energy storage and demand response to take its place. 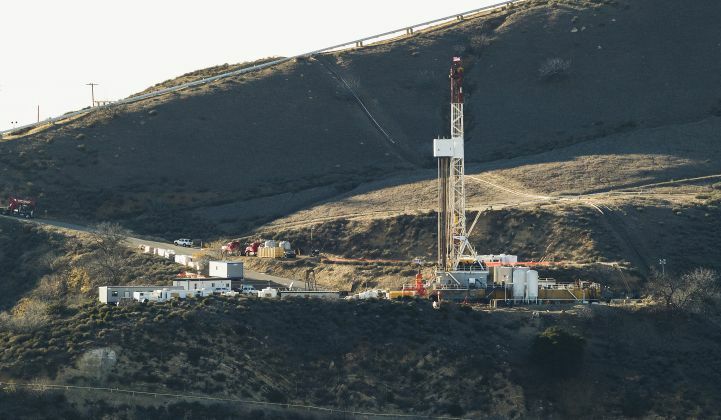 Aliso Canyon, the leaking natural-gas storage site that’s been shut down for the past year and a half, has driven utilities Southern California Edison and Southern California Gas to invest millions in demand response, batteries, and other distributed energy resources. Now California Governor Jerry Brown wants it to be closed permanently, forcing utilities and state regulators to come up with a plan to replace a major part of the region’s energy infrastructure with a lot more of the same. To get there, Weisenmiller suggested the CEC and CPUC work together on a plan to “phase out the use of the Aliso Canyon natural gas storage facility within 10 years,” as part of a joint study ordered by 2016 state law Senate Bill 380. Ten years is a long time, certainly for the people living in neighborhoods poisoned by the October 2015 gas leaks that forced the site’s closure, as well as for everyone working toward meeting California’s greenhouse gas reduction goals. But for utilities, grid operators and regulators, it’s a looming deadline. Before its closure in January 2016, Aliso Canyon was a critical source of fuel for power plants providing nearly 10,000 megawatts of peak capacity in the Los Angeles Basin. Much of that required to keep the grid stable at times of high demand or during emergency conditions, leading a joint state agency study to warn of the risk of multi-day blackouts without a wide range of energy efficiency, solar power, demand response, energy storage, and other distributed energy resources to take its place. The threat drove the CPUC to fast-track utility deployments of DERs in record time, starting with Southern California Edison’s procurement of more than 70 megawatts of energy storage from Tesla, Greensmith Energy and AES Energy Storage. SCE has also turned to Nest to enable 50 megawatts of smart thermostat-enabled peak load reduction, tapping about 50,000 of its existing customers in the region with utility incentives and fine-tuned behavioral and automated demand response. Southern California Gas is also working with Nest to manage thermostats -- not to reduce summer peak air conditioning usage, but to lower natural-gas heating bills. While its results so far have been measured in terms of overall efficiency, not peak capacity, it coincides with smaller but challenging regional winter peak in demand for electricity and gas. SoCalGas provides the option for a rebate without customers giving over any device control, and its Seasonal Savings program is available to all customers, not just those who receive a rebate. These combined projects represent a little more than one-tenth of the generation capacity fed by Aliso Canyon’s reserves. Replacing Aliso Canyon’s capacity and reliability is no small task, and “not one that I take lightly or without thoughtful consideration,” Weisenmiller wrote. Southern California Gas, which owns and operates Aliso Canyon, issued a statement Wednesday in response to the CEC letter, citing “the importance of this storage field to the energy reliability of the region,” and noting that the CPUC and the state Division of Oil, Gas and Geothermal Resources have just this week released reports on the facility’s safety. The CPUC issued a statement Wednesday finding that the facility was safe to reopen, albeit "at a greatly reduced capacity, in order to protect public safety and prevent an energy shortage in Southern California." Any new injections would be held to "the most rigorous monitoring, inspection and safety requirements in the nation and will store only the minimum gas necessary to supply the Los Angeles area." As part of the CPUC’s work under SB 380, SoCalGas wrote that it "will work with State agencies and other stakeholders to meet the current and future energy needs of our customers."